Another Singaporean pickle recipe! These are a delicious twist on dill pickles. Acar Timun is a good combination to go with nasi beryani, nasi minyak, nasi tomato, steamed rice and ikan goreng. They’re spicy in the sense of being spiced; if you like more heat, add more chili powder or chilli paste! 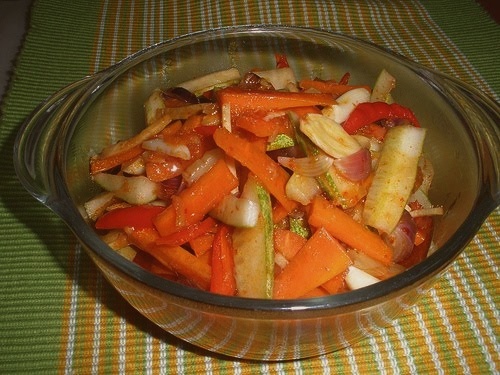 Related recipe – Acar Buahan. Cut cucumber in half lengthwise and remove the seeds. Cut flesh into 3.5 cm juliennes. Mix 1 tsp salt with cucumbers, and let sit for 15 minutes to draw out the extra moisture. Cut the carrot into pieces the same size as the cucumber. Heat oil in a wok and add ginger and mustard seeds, cooking until mustard seeds pop. Stir in the turmeric and chili powder, then add the vegetables, sliced chillies, sugar, and salt and saute for 2 minutes (do not overcook, the vegetables should stay crunchy). Remove from heat and mix well with vinegar. Allow the vegetables to cool in the pan, then place in a jar. Refrigerate Acar Timun overnight before serving.